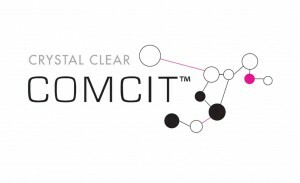 Since its official launch in 2014, Crystal Clear COMCIT™ has been enhanced to not only perform the original COMCIT™ treatment, but now includes microdermabrasion, micro-needling and oxygen. This revolutionary anti-ageing treatment is the first of its kind in the world and the results are instant – defying the ageing process for both men and women. 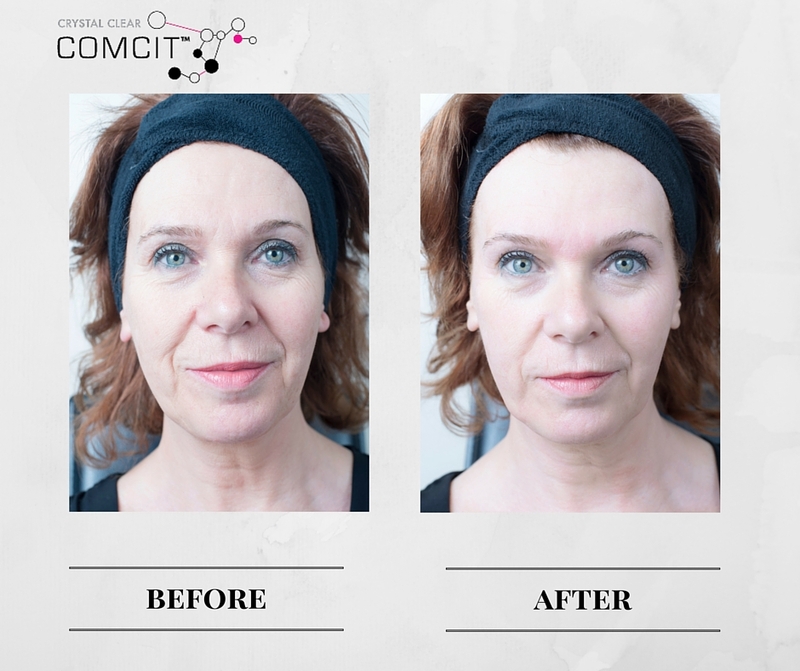 COMCIT goes beyond all conventional anti-ageing treatments. For the very first time all of the following skin rejuvenation modalities have been included in one incredible treatment. COMCIT employs a revolutionary Cryo Probe, that discharges cold oxygen through an internal peltier system and delivers onto the skin without any feeling of discomfort. The cold oxygen rapidly cools the skin and stimulates the micro-circulation, positively increasing blood supply and thus providing nutrients necessary for the stimulation of fibro-blasts for collagen production. The Microchannelling Roller offers multiple single-use head sizes, variable depending on individual treatment concerns. It is moved over the surface of the skin to create microscopic pinpricks. These pinpricks create columns within the epidermal dermal junction where collagen and elastin fibres are located. The COMCIT Cellular Infusion Solution penetrates into the columns and these minute punctures close almost immediately as the skin heals. The micro-induced trauma created to the dermis encourages the body to produce new collagen. As a result the skin becomes thicker, plumper and more youthful. Effectively stimulates the regeneration of dermal connective tissue, thereby increasing skin density. Significantly reduces wrinkle depth in the crows feet area. Reduced oxidation damage and inflammation (including from UV exposure). Vitamin C is an extremely powerful antioxidant. It is also one of the best-known skin brightening agents, proven to help prevent photo ageing and stimulate collagen synthesis. 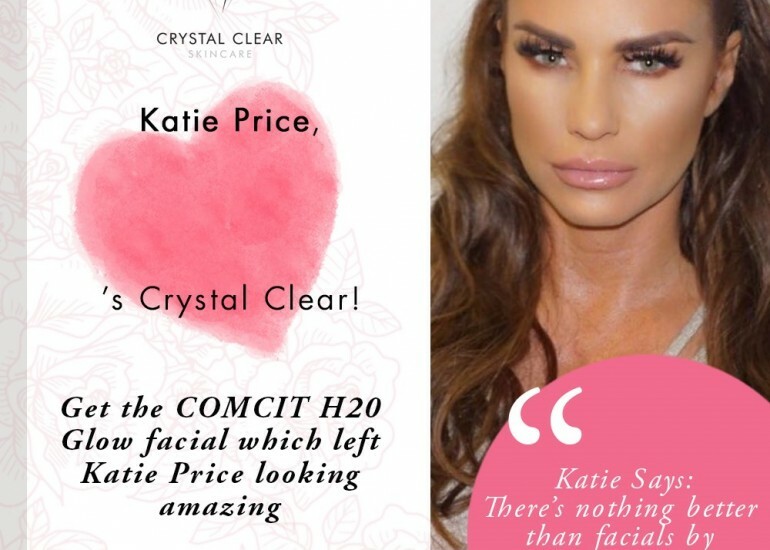 To complete the COMCIT treatment, a separate handset utilising Puncture Jet Technology allows oxygen, along with selected anti-ageing and restructuring ingredients, to be driven into the skin. It provides the lower layers of the skin with much needed nutrients to soothe repair and restructure from the inside out. Allows you to return to a normal lifestyle immediately, with no down time or interruption to their daily routine. 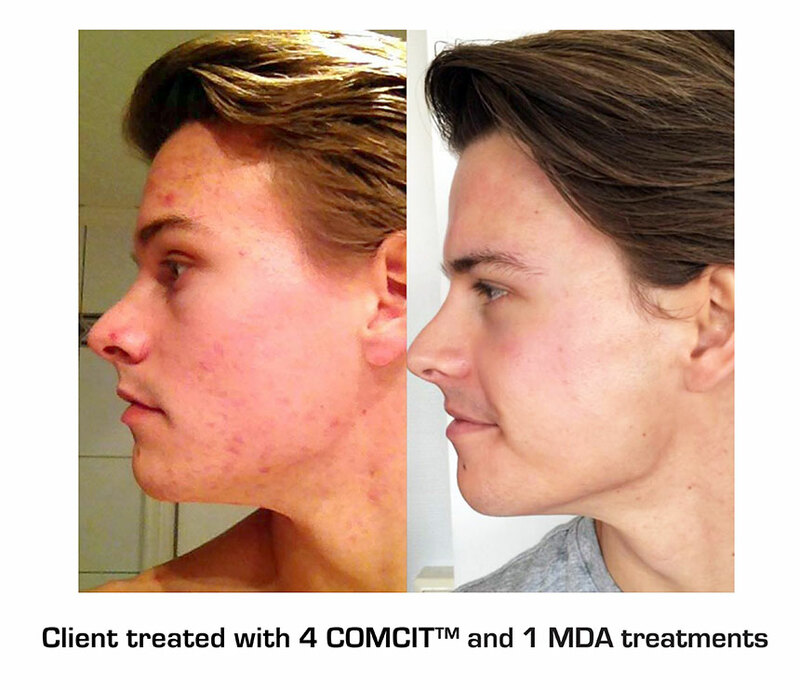 COMCIT is: Cryo Oxygen Microchannelling Collagen Induction Therapy. It offers the simultaneous delivery of Cryo Oxygen whilst our unique Microchannelling Roller creates thousands of microscopic channels in the dermal epidermal junction. This allows the topical infusion of powerful skin rejuvenation ingredients to be driven into the skin alongside cold oxygen. This is the most effective skin rejuvenation system yet, as we are effectively getting down to the layers where skin health begins. (These are the layers we need to reach to promote new collagen growth).